The Battle of Gaugamela (/ˌɡɔːɡəˈmiːlə/; Greek: Γαυγάμηλα), also called the Battle of Arbela (Greek: Ἄρβηλα), was the decisive battle of Alexander the Great's invasion of the Persian Achaemenid Empire. In 331 BC Alexander's army of the Hellenic League met the Persian army of Darius III near Gaugamela, close to the modern city of Dohuk in Iraqi Kurdistan. Though heavily outnumbered, Alexander emerged victorious due to his army's superior tactics and his deft employment of light infantry. It was a decisive victory for the Hellenic League and led to the fall of the Achaemenid Empire. Scene of the Battle of Gaugamela (also called "Battle of Arbela"). Engraving from 1913. Location of the Battle of Gaugamela. In November 333 BC Darius III had lost the Battle of Issus, resulting in the capture of his wife, his mother and his two daughters, Stateira II and Drypetis. Darius had retreated to Babylon, where he regrouped his remaining army. The victory at Issus had given Alexander control of southern Asia Minor. Following a victory at the Siege of Tyre (332 BC), which lasted from January to July, Alexander controlled the Levant. After his victory at Gaza Persian troop counts were low and the Persian satrap of Egypt, Mazaeus, peacefully surrendered to Alexander. Darius tried to dissuade Alexander from further attacks on his empire by diplomacy. Ancient historians provide different accounts of his negotiations with Alexander, which can be separated into three negotiation attempts. Justin, Arrian and Curtius Rufus write that Darius sent a letter to Alexander after the Battle of Issus. It demanded that he withdraw from Asia and release his prisoners. According to Curtius and Justin he offered a ransom for his prisoners, but Arrian does not mention a ransom. Curtius describes the tone of the letter as offensive. Alexander refused his demands. A second negotiation attempt took place after the capture of Tyre. Darius offered Alexander a marriage with his daughter Stateira II and all the territory west of the Halys River. Justin is less specific, not mentioning a specific daughter and speaking of a portion of Darius' kingdom. Diodorus Siculus likewise mentions the offer of all territory west of the Halys River, a treaty of friendship and a large ransom for the captives. Diodorus is the only ancient historian who mentions that Alexander concealed this letter and presented his friends with a forged one favorable to his own interests. Again Alexander refused. Darius started to prepare for another battle after the failure of the second negotiation attempt. Even so, he made a third and final effort to negotiate after Alexander's departure from Egypt. Darius' third offer was much more generous. He praised Alexander for the treatment of his mother Sisygambis and offered him all territory west of the Euphrates, co-rulership of the Achaemenid Empire, the hand of one of his daughters and 30,000 talents of silver. In the account of Diodorus, Alexander deliberated this offer with his friends. Parmenion was the only one who spoke up, saying, "If I were Alexander, I should accept what was offered and make a treaty." Alexander reportedly replied, "So should I, if I were Parmenion." Alexander again refused the offer of Darius, insisting that there could be only one king of Asia. He called on Darius to surrender to him or to meet him in battle to decide who was to be the sole king of Asia. The descriptions given by other historians of the third negotiation attempt are similar to the account of Diodorus, but differ in details. Diodorus, Curtius and Arrian write that an embassy was sent instead of a letter, which is claimed by Justin and Plutarch. Plutarch and Arrian mention the ransom offered for the prisoners was 10,000 talents, but Diodorus, Curtius and Justin give a figure of 30,000. Arrian writes that this third attempt took place during the Siege of Tyre, but the other historians place the second negotiation attempt at that time. With the failure of diplomacy, Darius decided to prepare for another battle with Alexander. After settling affairs in Egypt, Alexander returned to Tyre during the spring of 331 BC. He reached Thapsacus in July or August. Arrian relates that Darius had ordered Mazaeus to guard the crossing of the Euphrates near Thapsacus with a force of 3,000 cavalry. He fled when Alexander's army approached to cross the river. After crossing the Euphrates, Alexander followed a northern route instead of a direct southeastern route to Babylon. While doing so he had the Euphrates and the mountains of Armenia on his left. The northern route made it easier to forage for supplies and his troops would not suffer the extreme heat of the direct route. Captured Persian scouts reported to the Macedonians that Darius had encamped past the Tigris River and wanted to prevent Alexander from crossing. Alexander found the Tigris undefended and succeeded in crossing it with great difficulty. In contrast, Diodorus mentions that Mazaeus was only supposed to prevent Alexander from crossing the Tigris. He would not have bothered to defend it because he considered it impassable due to the strong current and depth of the river. Furthermore, Diodorus and Curtius Rufus mention that Mazaeus employed scorched-earth tactics in the countryside through which Alexander's army had to pass. After the Macedonian army had crossed the Tigris a lunar eclipse occurred. Following the calculations, the date must have been October 1 in 331 BC. Alexander then marched southward along the eastern bank of the Tigris. On the fourth day after the crossing of the Tigris his scouts reported that Persian cavalry had been spotted, numbering no more than 1000 men. When Alexander attacked them with his cavalry force ahead of the rest of his army, the Persian cavalry fled. Most of them escaped, but some were killed or taken prisoner. The prisoners told the Macedonians that Darius was not far away, with his encampment near Gaugamela. Several researchers have criticized the Persians for their failure to harass Alexander's army and disrupt its long supply lines when it advanced through Mesopotamia. Peter Green thinks that Alexander's choice for the northern route caught the Persians off guard. Darius would have expected him to take the faster southern route directly to Babylon, just as Cyrus the Younger had done in 401 BC before his defeat in the Battle of Cunaxa. The use of the scorched-earth tactic and scythed chariots by Darius suggests that he wanted to repeat that battle. Alexander would have been unable to adequately supply his army if he had taken the southern route, even if the scorched-earth tactic had failed. The Macedonian army, underfed and exhausted from the heat, would then be defeated at the plain of Cunaxa by Darius. When Alexander took the northern route, Mazaeus must have returned to Babylon to bring the news. Darius most likely decided to prevent Alexander from crossing the Tigris. This plan failed because Alexander probably took a river crossing that was closer to Thapsacus than Babylon. He would have improvised and chosen Gaugamela as his most favourable site for a battle. Jona Lendering argues the opposite and commends Mazaeus and Darius for their strategy. Darius would have deliberately allowed Alexander to cross the rivers unopposed in order to guide him to the battlefield of his own choice. Darius chose a flat, open plain where he could deploy his larger forces, not wanting to be caught in a narrow battlefield as he had been at Issus two years earlier, where he could not deploy his huge army properly. Darius had his soldiers flatten the terrain before the battle, to give his 200 war chariots the best conditions. However, this did not matter. On the ground were a few hills and no bodies of water that Alexander could use for protection, and in the autumn the weather was dry and mild. The most commonly accepted opinion about the location is (36°22′N 43°15′E﻿ / ﻿36.36°N 43.25°E﻿ / 36.36; 43.25), east of Mosul in modern-day northern Iraq – suggested by Sir Aurel Stein in 1938 (see his Limes Report, pp. 127–1). It is possible that the Persian army could have numbered over 100,000 men. One estimate is that there were 25,000 peltasts, 10,000 Immortals, 2,000 Greek hoplites, 1,000 Bactrians, and 40,000 cavalry, 200 scythed chariots, and 15 war elephants. Hans Delbrück estimates Persian cavalry at 12,000 because of management issues, Persian infantry less than that of the Greek heavy infantry, and Greek mercenaries at 8,000. Warry estimates a total size of 91,000; Welman 90,000; Engels (1920); Green (1990) no larger than 100,000 and Thomas Harbottle 120,000. According to Arrian, Darius' force numbered 40,000 cavalry and 1,000,000 infantry, Diodorus Siculus put it at 200,000 cavalry and 800,000 infantry, Plutarch put it at 1,000,000 troops (without a breakdown in composition), while according to Curtius Rufus it consisted of 45,000 cavalry and 200,000 infantry. Furthermore, according to Arrian, Diodorus and Curtius, Darius had 200 chariots while Arrian mentions 15 war elephants. Included in Darius's infantry were about 2,000 Greek mercenary hoplites. According to Arrian, Indian troops were also deployed. He explains that Darius III "obtained the help of those Indians who bordered on the Bactrians, together with the Bactrians and Sogdianians themselves, all under the command of Bessus, the Satrap of Bactria". The Indians in questions were probably from the area of Gandāra. Indian "hill-men" are also said by Arrian to have joined the Arachotians under Satrap Barsentes, and are thought to have been either the Sattagydians or the Hindush. While Darius had a significant advantage in numbers, most of his troops were of a lower quality than Alexander's. Alexander's pezhetairoi were armed with a six-metre pike, the sarissa. The main Persian infantry was poorly trained and equipped in comparison to Alexander's pezhetairoi and hoplites. The only respectable infantry Darius had were his 2,000 Greek hoplites and his personal bodyguard, the 10,000 Immortals. The Greek mercenaries fought in a phalanx, armed not with a heavy shield but with spears no longer than three metres, while the spears of the Immortals were two metres long. Among the other Persian troops, the most heavily armed were the Armenians, who were armed the Greek way and probably fought as a phalanx. The rest of Darius' contingents were much more lightly armed; the main weapon of the Achaemenid army historically was the bow and arrow, and javelin. Alexander commanded Greek forces from his kingdom of Macedon and the Hellenic League, along with Greek mercenaries and levies from the Paeonian and Thracian tributary peoples. According to Arrian, the most reliable historian of Alexander (who is believed to be relying on the work of the eyewitness Ptolemy), his forces numbered 7,000 cavalry and 40,000 infantry. Most historians agree that the Macedonian army consisted of 31,000 heavy infantry, including mercenaries and hoplites from other allied Greek states in reserve, with an additional 9,000 light infantry consisting mainly of peltasts with some archers. The size of the Greek mounted arm was about 7,000. The battle began with the Persians already present at the battlefield. Darius had recruited the finest cavalry from his Eastern satrapies and from an allied Scythian tribes and deployed scythed chariots, for which he had ordered bushes and vegetation removed from the battlefield to maximise their effectiveness. He also had 15 Indian elephants supported by Indian chariots. Darius placed himself in the center with his best infantry, as was the tradition among Persian kings. He was surrounded by, on his right, the Carian cavalry, Greek mercenaries and Persian horse guards. In the right-center he placed Persian foot guards (Apple Bearers/Immortals to the Greeks), the Indian cavalry and his Mardian archers. On both flanks were the cavalry. Bessus commanded the left flank with the Bactrians, Dahae cavalry, Arachosian cavalry, Persian cavalry, Susian cavalry, Cadusian cavalry and Scythians. Chariots were placed in front with a small group of Bactrians. Mazaeus commanded the right flank with the Syrian, Median, Mesopotamian, Parthian, Sacian, Tapurian, Hyrcanian, Caucasian Albanian, Sacesinian, Cappadocian and Armenian cavalry. The Cappadocians and Armenians were stationed in front of the other cavalry units and led the attack. The Albanian and Palestinian cavalry were sent around to flank the Greek left. The Macedonians were divided into two, with the right side under the direct command of Alexander and the left of Parmenion. Alexander fought with his Companion cavalry. With it was the Paionian and Greek light cavalry. The mercenary cavalry was divided into two groups, veterans on the flank of the right and the rest in front of the Agrians and Greek archers, who were stationed next to the phalanx. Parmenion was stationed on the left with the Thessalians, Greek mercenaries and Thracian cavalry. There they were to pull off a holding maneuver while Alexander landed the decisive blow from the right. On the right-center were Cretan mercenaries. Behind them were Thessalian cavalry under Phillip, and Achaean mercenaries. To their right was another part of the allied Greek cavalry. From there came the phalanx, in a double line. Outnumbered over 5:1 in cavalry, with their line surpassed by over a mile, it seemed inevitable that the Greeks would be flanked by the Persians. The second line was given orders to deal with any flanking units should the situation arise. This second line consisted of mostly mercenaries. Alexander began by ordering his infantry to march in phalanx formation towards the center of the enemy line. The Macedonians advanced with the wings echeloned back at 45 degrees to lure the Persian cavalry to attack. While the phalanxes battled the Persian infantry, Darius sent a large part of his cavalry and some of his regular infantry to attack Parmenion's forces on the left. During the battle Alexander used an unusual strategy which has been duplicated only a few times. While the infantry battled the Persian troops in the centre, Alexander began to ride all the way to the edge of the right flank, accompanied by his Companion Cavalry. His plan was to draw as much of the Persian cavalry as possible to the flanks, to create a gap within the enemy line where a decisive blow could then be struck at Darius in the centre. This required almost perfect timing and manoeuvring and Alexander himself to act first. He would force Darius to attack (as they would soon move off the prepared ground), though Darius did not want to be the first to attack after seeing what happened at Issus against a similar formation. In the end, Darius' hand was forced, and he attacked. The Scythian cavalry from the Persian left wing opened the battle by attempting to flank Alexander's extreme right. What followed was a long and fierce cavalry battle between the Persian left and the Macedonian right, in which the latter, being greatly outnumbered, was often hard-pressed. However, by careful use of reserves and disciplined charges, the Greek troops were able to contain their Persian counterparts, which would be vital for the success of Alexander's decisive attack. Then the Scythian cavalry rode along the line, and came into conflict with the front men of Alexander's array, but he nevertheless still continued to march towards the right, and almost entirely got beyond the ground which had been cleared and levelled by the Persians. Then Darius, fearing that his chariots would become useless, if the Macedonians advanced into the uneven ground, ordered the front ranks of his left wing to ride round the right wing of the Macedonians, where Alexander was commanding, to prevent him from marching his wing any further. This being done, Alexander ordered the cavalry of the Grecian mercenaries under the command of Menidas to attack them. But the Scythian cavalry and the Bactrians, who had been drawn up with them, sallied forth against them and being much more numerous they put the small body of Greeks to rout. Alexander then ordered Aristo at the head of the Paeonians and Grecian auxiliaries to attack the Scythians, and the barbarians gave way. But the rest of the Bactrians, drawing near to the Paeonians and Grecian auxiliaries, caused their own comrades who were already in flight to turn and renew the battle; and thus they brought about a general cavalry engagement, in which more of Alexander's men fell, not only being overwhelmed by the multitude of the barbarians, but also because the Scythians themselves and their horses were much more completely protected with armour for guarding their bodies. Notwithstanding this, the Macedonians sustained their assaults, and assailing them violently squadron by squadron, they succeeded in pushing them out of rank. The tide finally turned in the Greek favor after the attack of Aretes' Prodromoi, likely their last reserve in this sector of the battlefield. By then, however, the battle had been decided in the center by Alexander himself. The Persians also who were riding round the wing were seized with alarm when Aretes made a vigorous attack upon them. In this quarter indeed the Persians took to speedy flight; and the Macedonians followed up the fugitives and slaughtered them. Darius now launched his chariots at those troops under Alexander's personal command; many of the chariots were intercepted by the Agrianians and other javelin-throwers posted in front of the Companion cavalry. 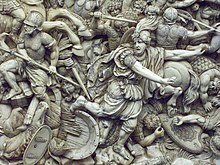 Those chariots who made it through the barrage of javelins charged the Macedonian lines, which responded by opening up their ranks, creating alleys through which the chariots passed harmlessly. The Hypaspists and the armed grooms of the cavalry then attacked and eliminated these survivors. For a short time there ensued a hand-to-hand fight; but when the Macedonian cavalry, commanded by Alexander himself, pressed on vigorously, thrusting themselves against the Persians and striking their faces with their spears, and when the Macedonian phalanx in dense array and bristling with long pikes had also made an attack upon them, all things together appeared full of terror to Darius, who had already long been in a state of fear, so that he was the first to turn and flee. The twenty-fourth [day of the lunar month], in the morning, the king of the world [i.e., Darius] [erected his] standard [lacuna]. Opposite each other, they fought and a heavy defeat of the troops [of the king he inflicted]. The king [i.e., Darius], his troops deserted him and to their cities [they went]. They fled to the land of the Guti. Alexander could have pursued Darius at this point. However, he received desperate messages from Parmenion (an event that would later be used by Callisthenes and others to discredit Parmenion) on the left. Parmenion's wing was apparently encircled by the cavalry of the Persian right wing; being attacked from all sides, it was in a state of confusion. Alexander was faced with the choice of pursuing Darius and having the chance of killing him, ending the war in one stroke but at the risk of losing his army, or going back to the left flank to aid Parmenion and preserve his forces, thus letting Darius escape to the surrounding mountains. He decided to help Parmenion, and followed Darius later. 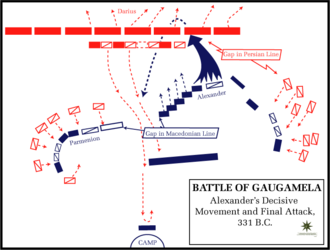 While holding on the left, a gap had opened up between the left and center of the Macedonian phalanx, due to Simmias' brigade of pezhetairoi being unable to follow Alexander in his decisive attack, as they were being hard-pressed. The Persian and Indian cavalry in the center with Darius broke through. Instead of taking the phalanx or Parmenion in the rear, however, they continued towards the camp to loot. They also tried to rescue the Queen Mother, Sisygambis, but she refused to go with them. These raiders were in turn attacked and dispersed by the rear reserve phalanx as they were looting. What happened next was described by Arrian as the fiercest engagement of the battle, as Alexander and his companions encountered the cavalry of the Persian right, composed of Indians, Parthians and "the bravest and most numerous division of the Persians", desperately trying to get through to escape. Sixty Companions were killed in the engagement, and Hephaestion, Coenus and Menidas were all injured. Alexander prevailed, however, and Mazaeus also began to pull his forces back as Bessus had. However, unlike on the left with Bessus, the Persians soon fell into disorder as the Thessalians and other cavalry units charged forward at their fleeing enemy. After the battle, Parmenion rounded up the Persian baggage train while Alexander and his bodyguard pursued Darius. As at Issus, substantial loot was gained, with 4,000 talents captured, the King's personal chariot and bow and the war elephants. It was a disastrous defeat for the Persians and one of Alexander's finest victories. ^ a b c d e f Arrian 1893. ^ Diodorus Siculus 1963, footnote 79. ^ Justin 1853, 11.12.1–2; Arrian 1893, 2.14; Quintus Curtius Rufus 1880, 4.1.7–14. ^ Justin 1853, 11.12.1–2; Quintus Curtius Rufus 1880, 4.5.1–8. ^ Diodorus Siculus 1963, 17.39.1–2. ^ Diodorus Siculus 1963, 17.54.1–6. ^ Diodorus Siculus 1963, 17.54.1–6; Quintus Curtius Rufus 1880, 4.11; Arrian 1893, 2.25. ^ Justin 1853, 11.12; Plutarch 1919, 4.29.7–9. ^ Arrian 1893, 3.7; Diodorus Siculus 1963, footnote 62. ^ a b c Arrian 1893, 3.7. ^ Diodorus Siculus 1963, 17.55; Quintus Curtius Rufus 1880, 4.9.14. ^ Diodorus Siculus 1963, footnote 77. ^ Ward 2014, p. 24; Cummings 2004, p. 216. ^ Green 2013, p. 282–285. ^ Hanson 2007, p. 69–72. ^ a b c Delbrück 1990. ^ a b c Warry (1998) estimates a total size of 91,000, Welman 90,000, Thomas Harbottle 120,000, Engels (1920) and Green (1990) no larger than 100,000. ^ a b Quintus Curtius Rufus 1880. ^ a b c Arrian 1893, 3.8. ^ Figure 59 in Dynasty and Empire in the Age of Augustus. ^ Diodorus Siculus 1963, 17.53. ^ Quintus Curtius Rufus 1880, 4.12.13. ^ a b c Magee et al., The Achaemenid Empire in South Asia and Recent Excavations 2005, pp. 713-714. ^ Hanson 2007, p. 70–71. ^ Hanson 2007, p. 61. ^ a b Arrian 1893, 3.14. ^ This is shown reliably in the movie Alexander. Arrian (1893). Chinnock, E. J. (ed.). Anabasis Alexandri. Diodorus Siculus (1963). Welles, C. Bradford (ed.). Library of History. 17. Cambridge, Massachusetts: Harvard University Press. ISBN 978-0-674-99464-5. Plutarch (1936). "On the Fortune or the Virtue of Alexander". In Babbitt, Frank Cole (ed.). Moralia. 4. Cambridge, Massachusetts: Harvard University Press. pp. 379‑487. ISBN 978-0-674-99336-5. Plutarch (1919). "Life of Alexander". In Perrin, Bernadotte (ed.). Lives. 7. Cambridge, Massachusetts: Harvard University Press. pp. 707‑741. ISBN 978-0-674-99110-1. Quintus Curtius Rufus (1880). Vogel, Theodor (ed.). Histories of Alexander the Great. London. Cummings, Lewis Vance (2004). Alexander the Great. New York, New York: Grove Press. ISBN 978-0-8021-4149-1. Delbrück, Hans (1990). History of the Art of War. Translated by Walter J. Renfroe Jr. Lincoln, Nebraska: University of Nebraska Press. ISBN 978-0-8032-6584-4. Doge, Theodore Ayrault (1918). Alexander: A History of the Origin and Growth of the Art of War from the Earliest Times to the Battle of Ipsus, B.C. 301. Tales End Press. ISBN 978-1-105-60250-4. Engels, Donald W. (1980). Alexander the Great and the Logistics of the Greek Army. Berkeley and Los Angeles, California: University of California Press. ISBN 978-0-520-04272-8. Fox, Robin Lane (2006). Alexander the Great. Penguin UK. ISBN 978-0-14-192598-1. Fuller, J. F. C. (1987). A Military History of the Western World: From the earliest times to the Battle of Lepanto. A Military History of the Western World. 1. Da Capo Press. ISBN 978-0-306-80304-8. Green, Peter (2013). Alexander of Macedon, 356–323 B.C. : A Historical Biography. Berkeley and Los Angeles, California: University of California Press. ISBN 978-0-520-95469-4. ——— (1993). Alexander to Actium: The Historical Evolution of the Hellenistic Age. Hellenistic Culture and Society. 1. Berkeley and Los Angeles, California: University of California Press. ISBN 978-0-520-08349-3. Lendering, Jona (2004). "What Happened at Gaugamela?". Hanson, Victor Davies (2007). Carnage and Culture: Landmark Battles in the Rise to Western Power. Anchor Books. ISBN 978-0-307-42518-8. De Santis, Marc G. (2001). "At The Crossroads of Conquest". Military Heritage. 3 (3): 46–55, 97. Van der Spek, R. J. (2003). "Darius III, Alexander the Great and Babylonian Scholarship". In Henkelman, W.; Kuhrt, A. (eds.). A Persian Perspective: Essays in Memory of Heleen Sancisi-Weerdenburg. Achaemenid History. 13. Leiden: Nederlands Instituut voor het Nabije Oosten. pp. 289–342. ISBN 978-90-6258-413-0. Ward, Steven R. (2014). Immortal: A Military History of Iran and Its Armed Forces. Washington, D. C.: Georgetown University Press. ISBN 978-1-62616-032-3. Warry, John (1998). Warfare in the Classical World. Barnes & Noble. ISBN 978-0-7607-1696-0. Welman, Nick. "Major Battles". Archived from the original on 2007-10-16. Welman, Nick. "About Alexander's Army". Archived from the original on 2007-10-16. Wikimedia Commons has media related to Battle of Gaugamela.